SEO (Search Engine Optimization) is the process of fetching heavy traffic from the free organic or natural search results on the search engine sites. Major search engines such as Google, Bing and Yahoo use a complex algorithm that turns data into search results. The higher your page ranks in the result, the better, as it allows more people to find your products or your contents. So what is the secret to getting the highest ranking? Basically, make sure your website has all the necessary components needed for the search engine known as Google. And thanks to the Yoast SEO plugin all the components are being compiled into one convenient package. Now on that note, let’s begin. In this tutorial, we are going to learn the basic concept of how to write a blog post with SEO YOAST Plugin. Login to your Dashboard. Go to Plugins, Add New. Type keyword “Yoast SEO”. Then click on the “Install Now” button. Then click on “Activate Plugin” button to activate it. Yoast SEO plugin is still the most widely used WordPress SEO plugin. Once installed it functions as an SEO checklist every time you create a new blog. 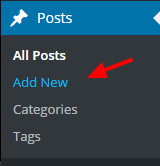 Go to Dashboard -> Post -> Add New, to add a new post in your WordPress Site. Now, write your blog’s title, contents, upload featured image and enter tags and categories too in the respective areas. Once you’ve done, you may publish the post. 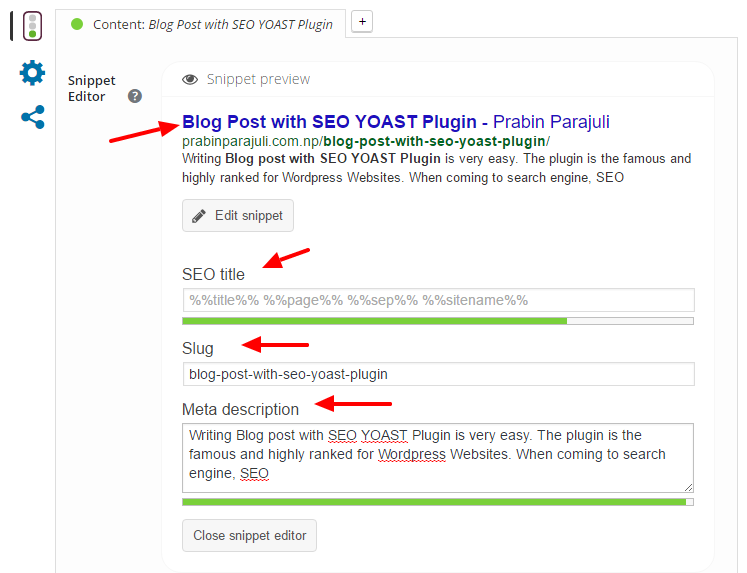 Each time you create a Post the Yoast SEO plugin panel will appear below the Content of post/page. Make sure you check Screen Options > Yoast SEO on top of the Dashboard. Yoast gives us the idea visually how our website will look in the search results by looking at the Snippet editor. On top of that, it allows us to change the Title, URL, and Description on the fly. SEO Title: Title is what user seeks it is the most important key. Make sure your title doesn’t exceed 55 character boundary. Use keyword always at the beginning because it benefits us when it comes to being indexed by Google. Slug: Slug generally refers to the post in title URL. Slug name should have the focus keyword which will benefit us for SEO. Meta Descriptions: Meta Description is what shows up below the title in the search engine. This is what provides the user a glance view that this page contains the information they are looking for. It should contain the keyword in an organic way because Google will automatically bold any of the user search items that will show up in your description. Focus Keyword is the main keyword which people will look and search in the search engine. You should select the focus keyword which is trending in google. It is the phrase which user feels comfortable to search on the internet. 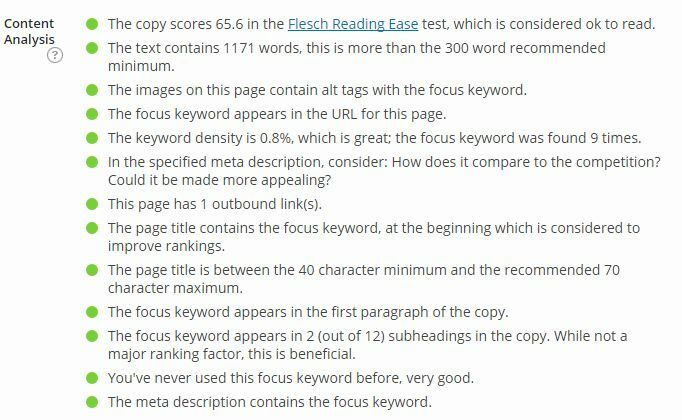 While writing a blog post pick a long tail keyword which will generate high-quality traffic to your blog. I generally pick a keyword which is similar with the main topic of my article i.e. “SEO Blog Post”. After you have one in mind go into the google and search it and pick one which is closer to the result. However, there are a variety of tools and techniques which are useful to find out related Keyword which is relevant to your blog post that you may not have considered. The Semrush and Google Adwords Keyword Tools are the great tools which allow you to find appropriate keywords which can generate the high volume of traffic to your site. Meta Description is what shows up below the title in the search engine. This is what provides the user a glance view that this page contains the information they are looking for. It should contain the keyword in an organic way because Google will automatically bold any of the user search items that will show up in your description. This part of the plugin automatically analyze the contents of your post and provides you the hints for increasing the SEO of your post. It is simple to understand. It guides you to improve the SEO of each element of your post. In short, it tells you how your pages are performing SEO wise. 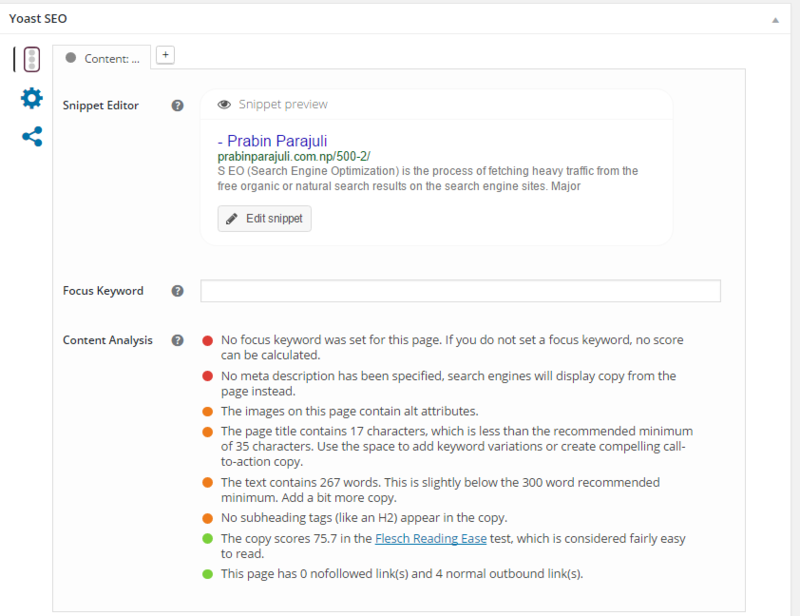 The red and orange dots indicates that things to be changed to improve the SEO of the post. Whereas green dots indicates you are good to go. Headings and Subheadings: The Heading is one of the very important aspects of your post. The Headings have different goals. H1 tag is the most important tag which you should never miss. Search spiders pay attention to the word used in the h1 tag. Subheadings are your article Pillars and help articles easier to digest. It helps readers to find and focus only on that part of the article that reader wishes to read. Internal Links/ Inbound Links: Internal link or Inbound link is a hyperlink which points the same domain to a different page on the very same domain. Internal linking allows users for navigating websites. Internal links also help in spreading ranking power around websites. They’re also used in inside page authority. e.g. External Links / Outbound Links: External link or Outbound link is a hyperlink which points other domains other than the same domain. In another word, according to Layman, if another website links to your own site this is known as External Link. Similarly, if you link out to another website, this is also considered as an external link. External links are used for high ranking of the websites. Alt tag in image: Search engine not only searches the text on your web page, but they also search for keywords within your image file names. Whenever you upload images to your blog be sure to include the keyword in the file name and fill out the alternative text. An Article should have at least 300 words. 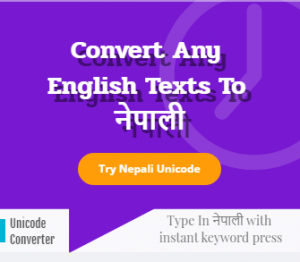 Use at least 40 characters in Title. Note: Do not engage in keyword stuffing, which is an act of filling your content with too many keywords which not only makes difficult to read also irritates your followers. In the WordPress glossary, both categories and tags are known as taxonomies. Categories are meant for the broad grouping of your posts whereas Tags are meant to describe specific details of your posts. Categories and tags help you organize your content in a meaningful and browsable format. Not only your users can easily find your content, it also boosts your site’s SEO. You have a content analysis tool which gives you feedback about the SEO aspects and SEO score of your site. The better the SEO, the better ranking of your site. So don’t hesitate to give your time on improving your SEO blog. If any query or suggestion, please comment below.